Of the many wonderful things I have seen thus far in Chicago, one of my favorites is the work that Mejay Gula, Kelly Van Eaton and Charlie Vinz, are doing with Chicago high school students through the After School Matters (here) program. 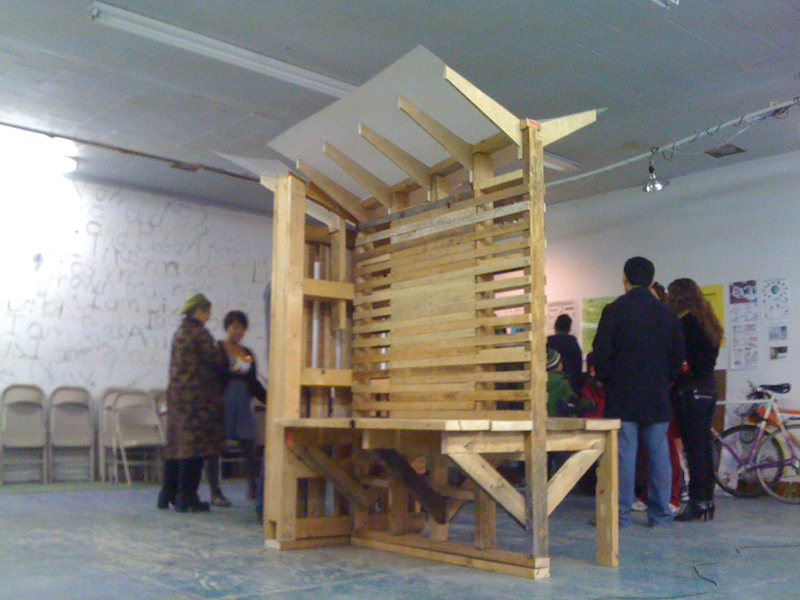 Last fall Mejay and Charlie worked with their students to design and build kiosks from scrap/reclaimed materials for a local community garden. Why is that particularly cool? Well, first off they used one of Public Workshop’s favorite tools for getting great work out of kids or communities: the full scale mock-up. From what I understand, they first ‘tested’ their kiosk prototypes by first making them out of foam core and chip board. Secondly, given Chicago’s often ‘challenging’ weather for all but a few months of the year, they built the kiosks indoors but made the just the right size to ‘roll’ (or with minimal disassembly) out the door of the studio in which they were working. Lastly, on the most basic level instead of trying to purely ‘teach’ kids about architecture they actually directly engaged them in changing their neighborhood. ‘Want students who are more engaged in their learning and communities? This is the way to do it ladies and gents. These are all concepts, tools and tactics that are essential to how we work at Public Workshop but it was a privilege to see a really smart, different take on these things. Bravo guys, very nice job. Keep your eyes peeled this Spring for more photos and reports on Mejay, Charlie, Kelly and their students’ excellent work as they refine, weatherize and install their designs in the garden. We can’t wait to see the results. You can see a few images they’ve posted on flickr of earlier process work by clicking (here). And Public Workshop couldn’t be more excited to possibly collaborate with Mejay, Charlie, Kelly, the Chicago Architecture Foundation and After School Matters this coming summer. We’ll let you know how that sorts out.